This entry was posted in Europe, Legal Drama, Movie, POW, Racism, Uncategorized, War Movie, WWII and tagged African American Soldiers in War Movies, Bruce Willis, Colin Farrell, Hart's War, Legal Drama, Movies, POW, Racism in the Military, Reviews, Terrence Howard, Vicellous Reon Shannon, War Movies. Of those kinds of movies that are neither this nor that kind, I guess you are calling them hybrids, when Platoon came out, soon after came Hamburger Hill and around that same time, a movie came out called Gardens of Stone with James Caan. I know I didn’t really view it favorably but perhaps I should give it another chance. Anyway, I am just mentioning this as another ‘war’ movie out there but I don’t know if it is worth the effot. Of course, Gardens of Stone means a Military cemetary. A lot of the action centers around the Arlington Military Cemetary in Washington DC during the Vietnam war but does not take place in Vietnam. From what I remember it is more about the duties of those who bury the dead. Now a footnote and I apologize for the detail and if it is too off topic, please let me know. Of course, this is connected to the Ethiopian invasion by Italy in the 1930s. Bob Marley and a lot of Reggae always made out Haile Sellasie to be, well, actually God I believe, but I read up on the conflict over there. Actually, the small country of Eritrea north of Ethiopia were allied with the Italians and the Ethiopians, though the people are actually basically the same and same language are ancient enemies (maybe similar to the Former Yugoslavia). That website shows in fact, the Eritreans welcomed the Italians yet, we rarely hear about that. For balance, apparently there is a British Cemetary in Eritrea too. Sorry, I hope this is not too off topic and it is a bit gloomy but as long as I mentioned Gardens of Stone, one of the lesser known movies, I thought this footnote might be of interest. Not off topic for me on the very contrary, found this highly interesting and will look at the links later when I have more time. “All About War Movies” was meant to leave some space for many things that were loosely related. As I had a post a while back “On Death and Dying”, this is not too gloomy for me. A movie about those who have to handle the dead, the very final stage of those who come back… An interesting angle. I believe I heard about Eritrea, would have to have closer look on Italian websites, maybe. Maybe there is even an Italian movie. Whoops, I hope that post was not too offtopic but this one IS NOT. First we will call this trivia in fact because it deals with the last two reviews you have posted!! What movie combines Sylvester Stallone with being a Prisoner of War??? I’m sure you know this one. Add in, the sport of soccer/football I happened to see a ball on the main page as well for some movie. Okay, also, the movie stars Pele, Bobby Moore, Ossie Ardiles, of course, these are all players and surely I missed some. Well, I don’t need to say what the movie is now, it is obvious or one can find out with all of those names and a good websearch. I am a bit biased when it comes to Stallone… So I have not seen the movie (not revealing the name here on purpose, as people like quizes…). Anyway, do you recommend it? Or just mentioned it because it covers the topic POW as well? With 20/20 hindsight, I think the Stallone/Pele movie is a good movie to watch with suspense, a clear plot. At the least, I’ve seen it called the best soccer/football movie ever. It’s been a while since I saw it, but I remember not being impressed. I love some of your lines, especially “disappointment is the daughter of bad choice and false expectations.” I also like the hybrid tag. You are spot on with that. TPC’s reference to “Victory” is another good example of a hybrid. Without a doubt the best WWII soccer movie! Better than all the other ones. I show it to my soccer team and encourage my goalies to pay close attention to Sylvester Stallone’s goalie skills. I have no idea why he did not win an Oscar as Best Actor. Glad you like some of the lines. Stallone. Lol. Maybe he will one day… I should watch it, it sounds as if I would find it hilarious. 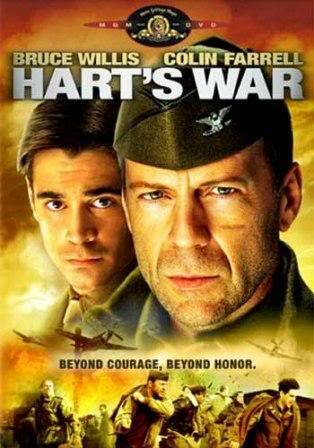 Too be honest, i think Hart’s War was more entertaining than The Way Back.